Lay’s has embarked on a mission to spread smiles and make a difference along the way with its #SmileWithLays campaign. A new 30-second spot, titled “Get a Smile. Give a Smile.”, features several persons having fun together and using a Lay’s Smile Bag to give a a smile. Various flavors are showcased throughout the ad, which is soundtracked by Daniel Skye’s 2016 single “Smile”. “There’s nothing better than sharing a smile. Get a Lay’s Smile Bag today and we’ll make a donation to Operation Smile,” the voiceover says at the end of the commercial. Lay’s potato chips are available in a range of flavors including Cheddar & Sour Cream, Dill Pickle, Flamin’ Hot, Barbecue, Chile Lemon, Deli Style, Honey Barbecue, Limon, Pico Gallo, and more. The brand also sells Poppables Potato Snacks, Wavy Potato Chips that are also available in a variety of flavors, from Hickory BBQ to Roasted Garlic & Sea Salt, and Milk Chocolate, and Kettle Cooked 40% Less Fat Potato Chips, also available in several flavors, from Cream Cheese & Chive to Jalapeno. The idea behind this campaign is that smiles are powerful, a smile can make you feel better and lift the mood of those around you. The brand wanted to “give people a simple fun reminder to smile” and teamed up with Jordin Sparks to help spread smiles. 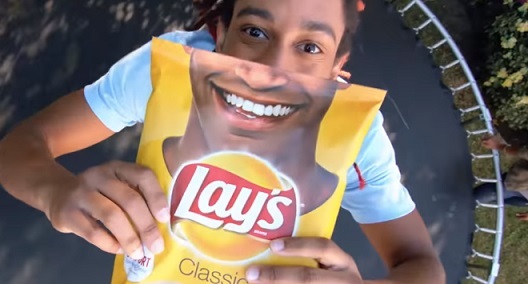 The singer encourages people to grab a Lay’s bag, hold it so that the smile on the bag would seem their smile, take a picture and post it with #SmileWithLays on social media. She says “every time you buy a Lay’s smile bag, you’ll be helping Lay’s donate up to a million dollars to Operation Smile, an organization that is making a difference one smile at a time”. For each specially marked Lay’s Smile Bag purchased between February 12, 2018 and April 7, 2018, Lay’s will donate $0,1 to Operation Smile. The minimum sum guaranteed is $500.000 and the maximum is, as specified, $1.000.000.